ADAY as a brand is all about simplifying life, whether it's about headspace, wellness or wardrobes. So, while the simplicity tour was about showing the newest collections, it was also to bring together people who shared their mission. 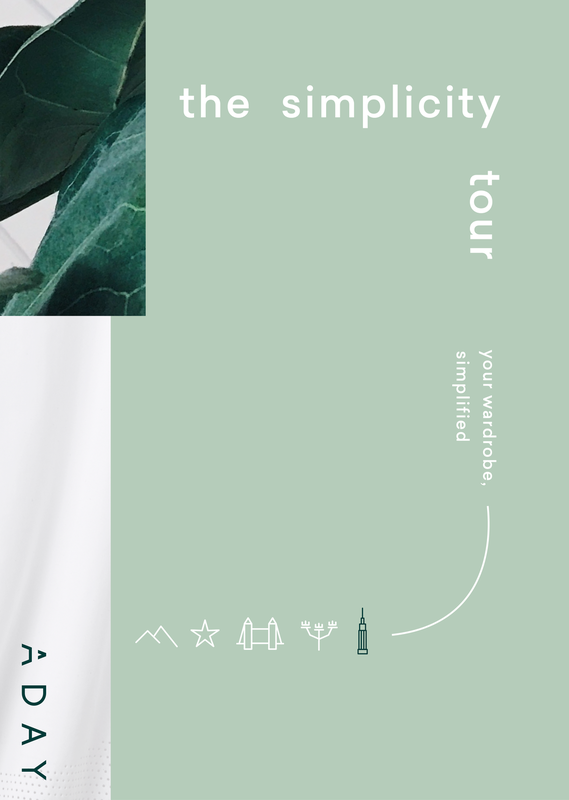 I developed the visual language of the tour and designed all the printed material, such as invites, posters, swing tags and tote bags, as well as the website where we announced where we where going and all the events we were hosting and animations. I also designed email versions of all invites and reminders and IG stories. We also had a more permanent store on Elizabeth Street in Nolita, NYC, where I was in charge of the visual merchandising, the window display, artwork for the walls, slideshows and animations to be displayed on iPads and iMacs: in other words all things creative.